well made, FAST (super fast) shipping, can't wait to get out and use it. After seeing the one purchased by EA Bivens and on his suggestion, I ordered this well made and authentic reproduction. Compared to my original 4th Infantry USV marked one it is an exact copy. Thanks for the continued good work. I am very happy with it. Thank you Jerry. 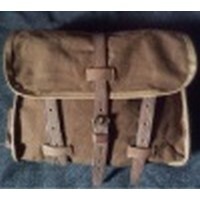 Very well made item,when put next to the original in my collection,it's a " dead-on" match in material and construction.Same for the 1878 Haversack I also purchased,just like having a "new,un-issued" original.Great job, Thanks!!!!! Although this item was not used in the Spanish American War,I have photos of it being used in the Phillipine Insurrection. Thanks for remembering the accoutrements needed to round out our impressions. As always the material quality, workmanship, and attention to faithful reproduction of the details in the original design are excellent. There are lots of small internal pockets for storing utensils, and small pewter buttons with leather thong closures. Beautiful item!